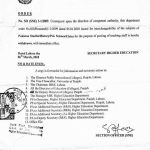 Govt of the Punjab School Education Department has issued Notification No. 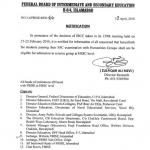 SO (SE-I)1-10/2011 dated 27th February 2013, regarding the Priorities/Procedure for the provision of Teaching Staff in the newly Upgraded Higher Secondary Schools where SNEs have not been approved according to the standard norm. in order to functionalized them efficiently, to provide working combinations and to avoid erratic postings/ adjustments therein. The available vacancies of Subject Specialists shall be filled in the following order/priority keeping in view the sanctioned number of posts of Subject Specialists in the institution concerned. 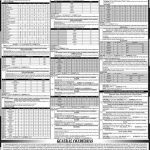 i- Compulsory Subjects of Intermediate level i.e English, Urdu. ii- Subjects of Science i.e Physics & Chemistry with Math or Biology or Both subjects as per availability of posts (Group-I). iii- Subject of Economics, Computer Science, Statistics and Commerce (Group-II). 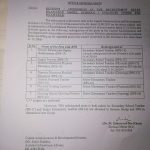 a- In case of sanction of two posts, the Subject Specialists of compulsory subjects as mentioned in group 1 shall be provided and Humanities/Arts Group will be started from the current academic year. 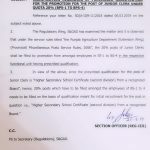 The existing staff of school will teach the subjects of Islamiyat (Elective), Education and other subjects of different combinations whose teaching can be managed from the existing staff including SSTs. b- While providing the Subject Specialists, it shall be kept in view that one complete group of subjects as per scheme of studies can be started. The concerned Principal shall observe this fact. c- The Principal may start the combination of subjects whose teachers are available from the existing staff. d- The services of Subject Specialists and SSTs will be utilized for teaching classes from 9th to 12th keeping in view the requirement to run a group of subjects as per scheme of studies. 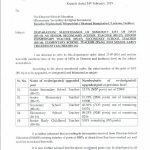 3- The staff already posted/adjusted in newly upgraded Higher Secondary School contrary to above mentioned instructions shall be treated as erratically posted and surrendered by the Principal concerned. DEO (SE) shall be responsible to ensure implementations and combination as given. 4- The number of groups and disciplines may be increased subject to availability of more posts but subject to prior approval of the Competent Authority.